A couple weeks ago, I was showing the kids a YouTube video when a commercial for an easy chicken recipe “interrupted” our video. 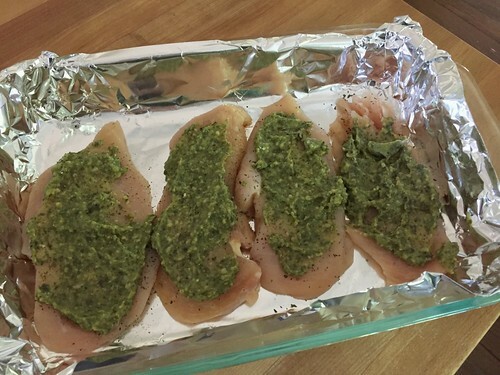 The next day, I made my own version of this cheesy pesto chicken — and boy was it tasty. I boiled some fettuccine noodles while the chicken baked and served up this super simple, summer time meal in less than 30 minutes from start to finish. It was a huge hit with our entire family! Preheat oven to 350ºF. Grease a 9″ x 13″ baking dish or line with foil. 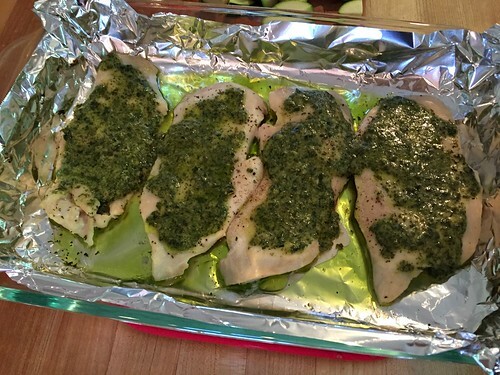 Spread roughly 1 to 2 T. of prepared pesto sauce on each chicken breast. 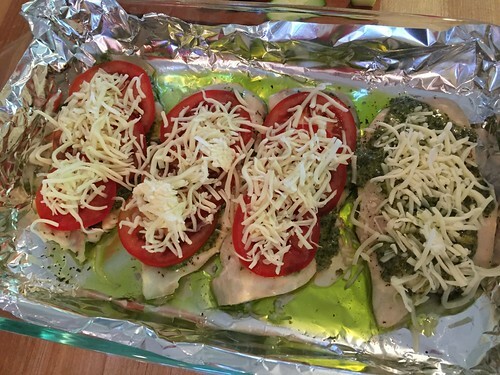 Remove from oven, layer chicken with sliced tomatoes and cheese. Serve with pasta (and additional sauce) or a big salad. See… it really is THAT simple! In fact, the most time-consuming part was preheating the oven… and the most ‘difficult’ was trying to evenly slice the chicken breasts in half so they would be thinner and bake faster. We will definitely enjoy this a few more times throughout the summer months… and one of these times, I might just have to make my own pesto sauce from scratch! Do you make your own pesto sauce? Made this for dinner tonight with boneless skinless thighs that have been languishing in our deep freeze and with some frozen tortellini I came across when cleaning the freezer yesterday. It was delicious and I have leftovers for another lunch or dinner this week. Thanks for the recipe! 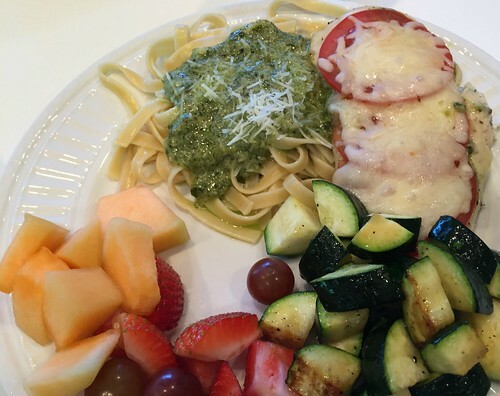 wow — amazing job cleaning out the freezer for this throw-together meal! Yum!! Made this for 25 tonight. It was great! Thanks! Sooo good. I made the pesto sauce from scratch and had beetroot salad on the side. Thank you!!! We love pesto too! I’m so glad my kids do because it’s one of my favorite things ever. Sometimes we make it and it is reeeeaaally easy. About the same amount of work as a smoothie. If you grow any basil in your garden your kids will probably like helping you pick it and make it once in awhile like mine do. We experiment with different nuts like walnuts, pistachios or hemp seeds. We’ve even made it without the Parmesan and it’s all been yummy. 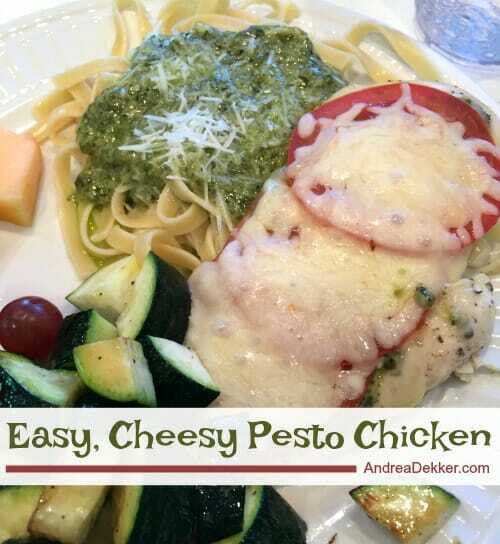 For a fun quick creamy pesto check out avocado pesto recipes. There’s definitely nothing wrong with store bought pesto too. Like you, I’ve never had a bad one yet! Yum! Looks delicious and simple! Thanks for sharing the recipe. The recipe title under the second photo says chicken spaghetti, which is different than the title of the post so I was a bit confused at first… No matter what it’s called though, it looks wonderfully versatile! I love the idea of cutting the chicken thinner from the start. Less cutting to do at the table for my little ones. oh whoops — just changed that typo 🙂 Thanks! My grocery has the thin-sliced boneless/skinless Perdue or Tyson chicken breast halves (AKA chicken cutlets) on BOGO sales, so I buy a bunch and freeze them, since the trying to slice horizontally is hard! Also, it’s easier if you partially freeze your chicken breast halves before trying to cut them yourself. 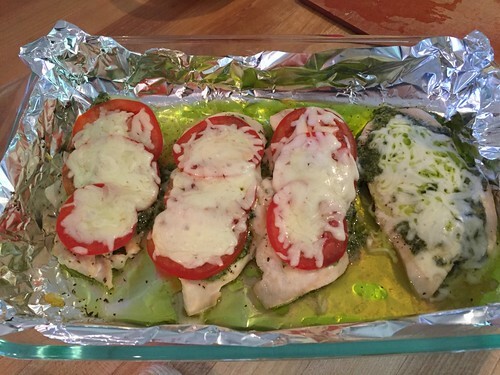 If I have basil (which I grow) but no pesto made, I just lay the beautiful healthy basil leaves on the chicken and cover with some parmesan cheese. “Deconstructed” pesto. Voila! The better the tomatoes, the better this is! If the tomatoes aren’t so good, like in winter, canned ones or tomato sauce works, or try mushrooms or olives. thanks for the tips Jenny! Also, I use a kitchen scissors to cut my chicken in half and it’s really not too difficult at all. That said, buying the chicken cutlets still sounds easier! I don’t have a recipe because I never make my own 🙂 I mentioned that maybe one of these days I’ll try to make my own! Ok, I guess I misunderstood and read it wrong! It looks really delicious! What section of the grocery store would I find pesto in? Andrea, what kind of pesto do you use? I don’t have a specific kind — just whatever is on sale. I haven’t had a bad one yet! Wow! This recipe looks awesome and so simple and quick to prepare – just great for a week-day meal. Thanks for sharing. I also use pesto on fish (like sole or haddock); also very easy to prepare – very similar to your chicken recipe above except without the cheese. our kids don’t love fish yet — so I’ll probably stick with chicken for now. however, good to know it taste yummy on fish (I wouldn’t have thought of that myself)! This looks delicious! 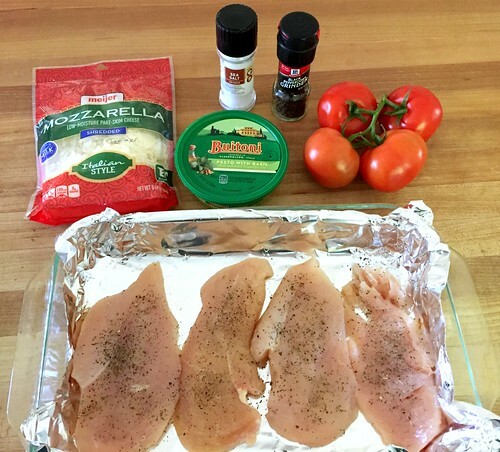 I’m always on the lookout for easy chicken recipes for my picky family! I’ll have to try this soon! ooooo, we LOVE the sweet and sour pork! and yes, you can easily add the brown sugar to the sauce — it’s a very forgiving recipe! yeah, summer lunches — I feel like I need to make a whole big meal now that Dave is home too. I keep telling myself, “simple is OK”!